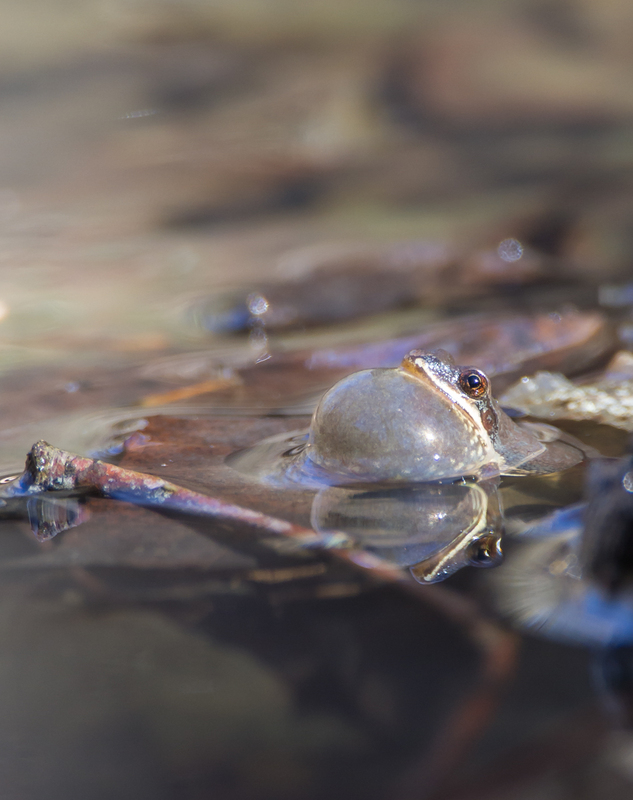 Every child should have mud pies, grasshoppers, water bugs, tadpoles, frogs, mud turtles, elderberries, wild strawberries, acorns , chestnuts, trees to climb…and any child who has been deprived of these has been deprived of the best part of education. 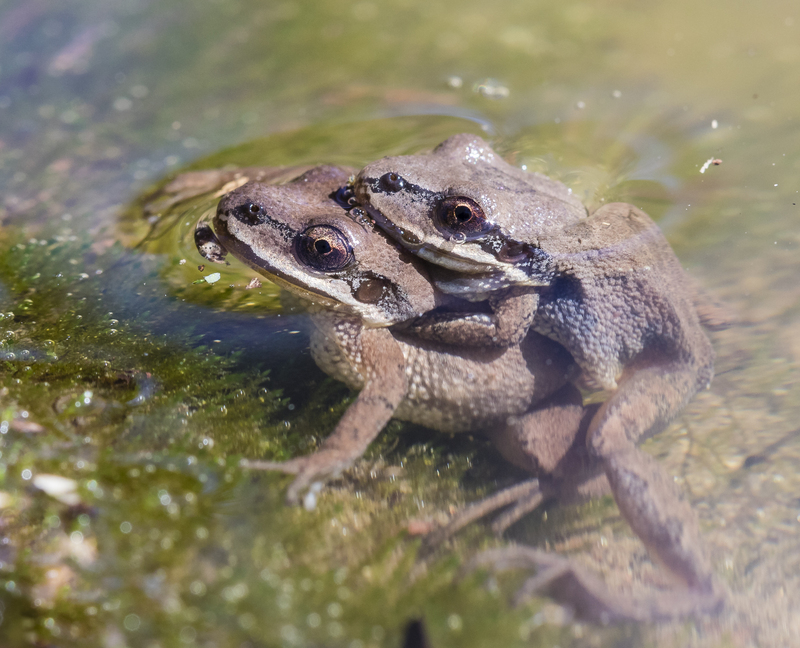 These tiny songsters have been calling and courting since early February in various pools at work (NC Botanical Garden). 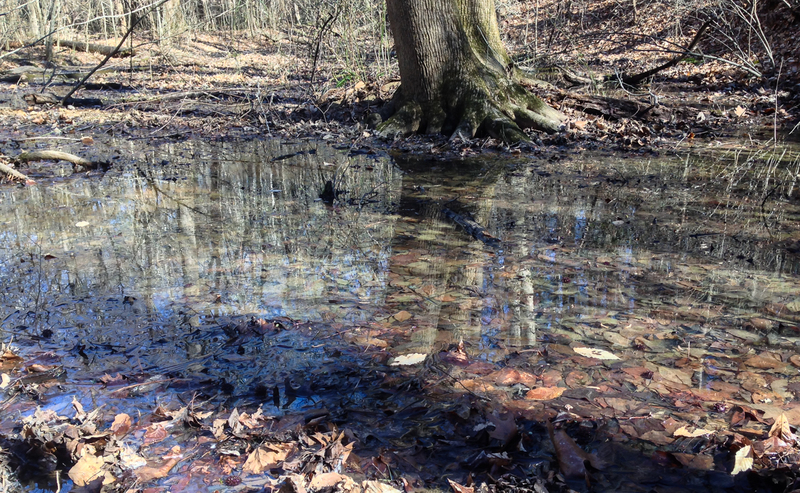 They normally prefer temporary (vernal) pools that often dry up in summer, making them unsuitable for fish. 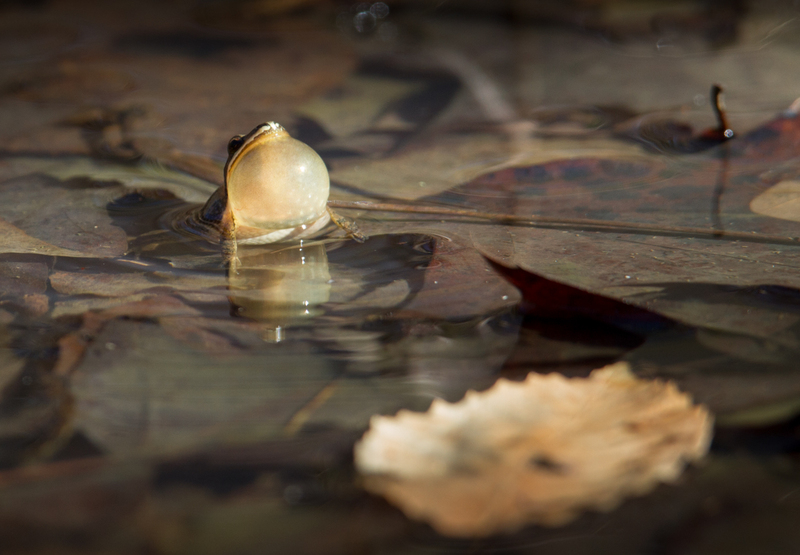 This year they are also breeding in our Turtle Pond, a permanent small pond that is loaded with tadpole predators, especially mosquitofish. 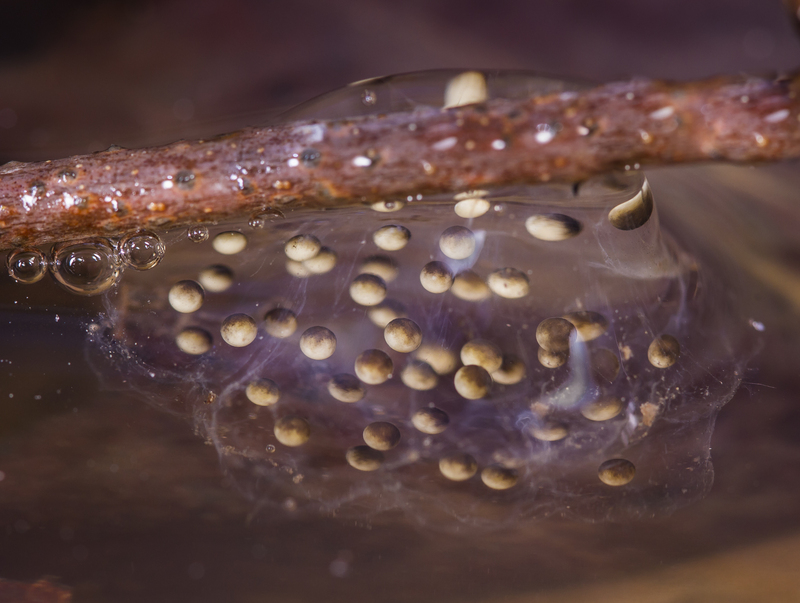 So, I pulled one of the egg masses out and brought it inside to photograph, with plans to release them in one of the nearby vernal pools before they transform into frogs. 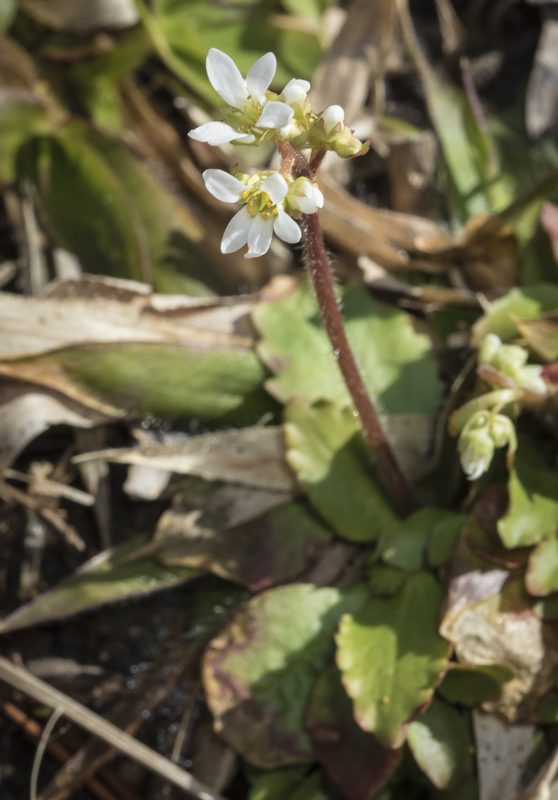 This species utilizes a wide variety of breeding sites, from natural vernal pools to water-filled tire ruts and roadside ditches. 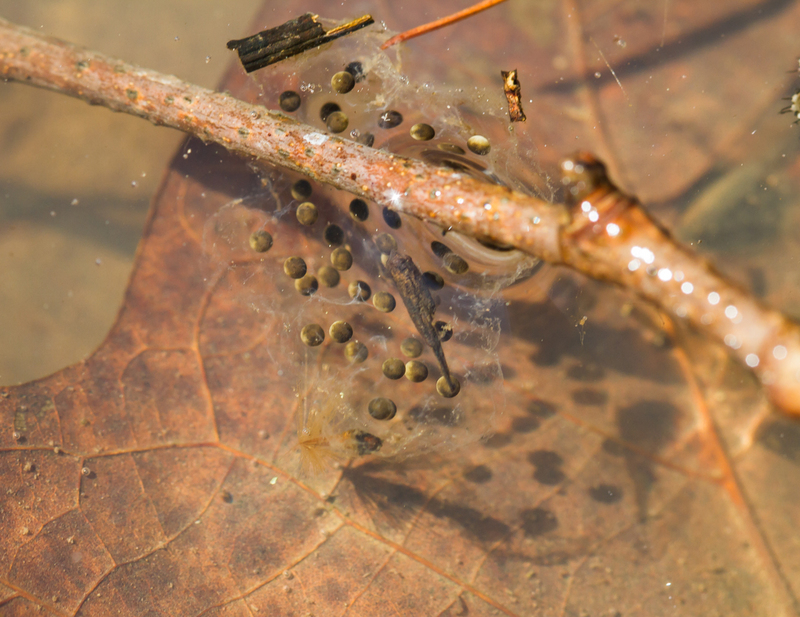 Females lay several small egg masses, each containing 50-100 eggs on average (this can vary greatly) for a total of about 1000 eggs each season. 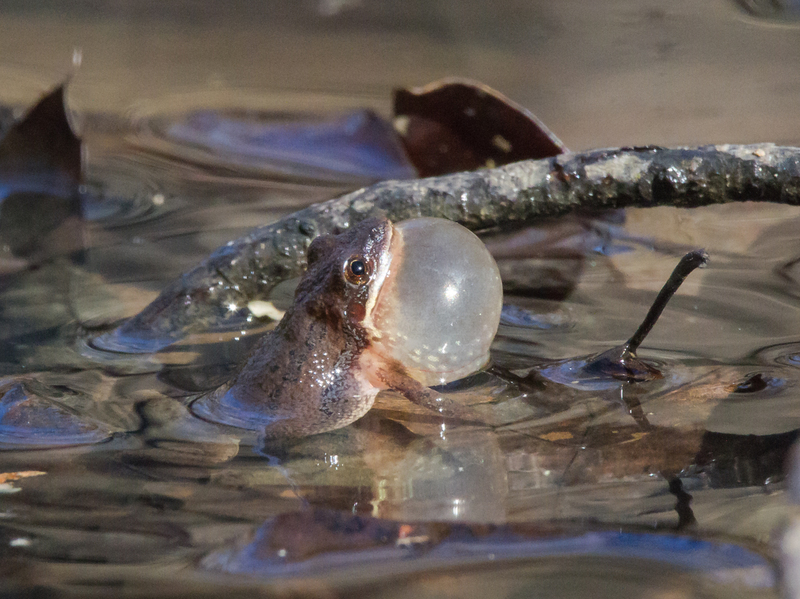 She usually attaches them to vegetation or a twig under the water. 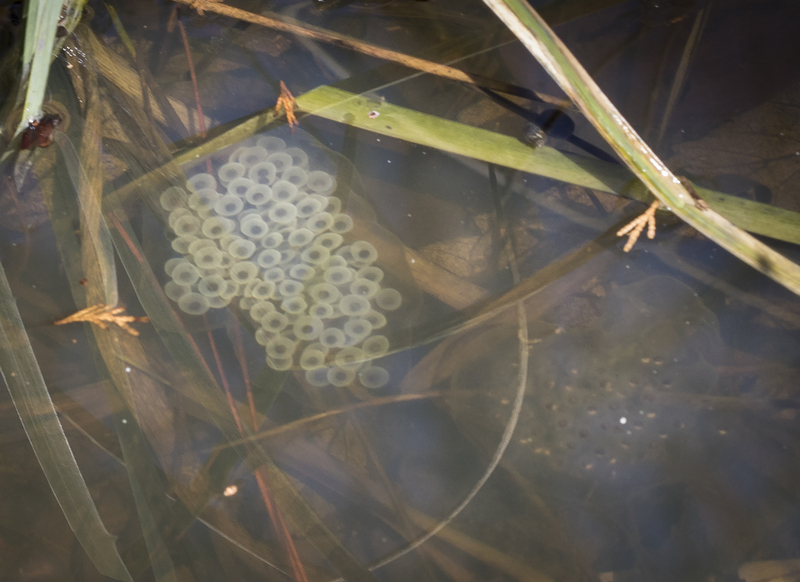 The eggs hatch within about a week, with the embryos transforming rapidly from a round blob to elongate stylized tadpoles. The ones in my office window started hatching on a Friday afternoon. 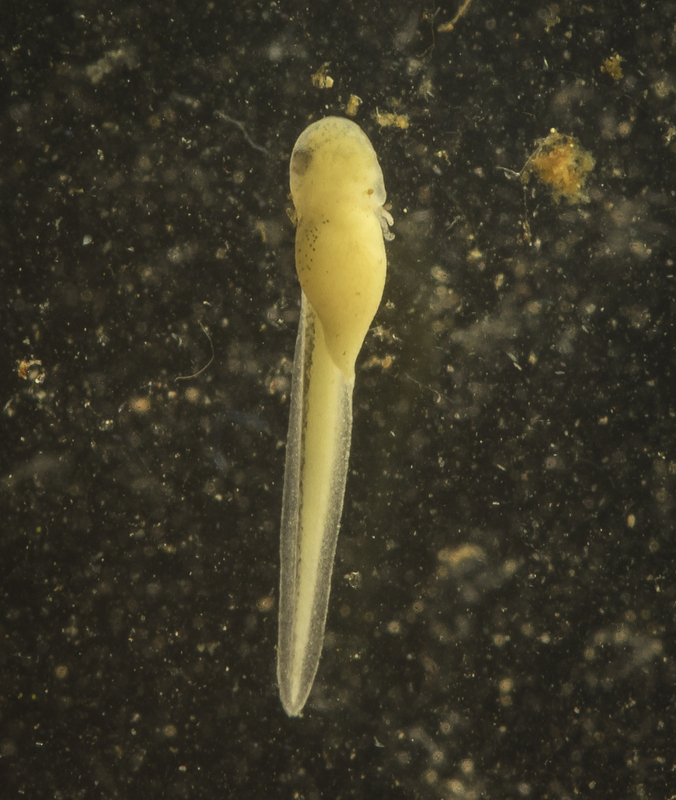 When I went in that Saturday, most were hanging vertically in the small aquarium like tiny cream-colored mummies. 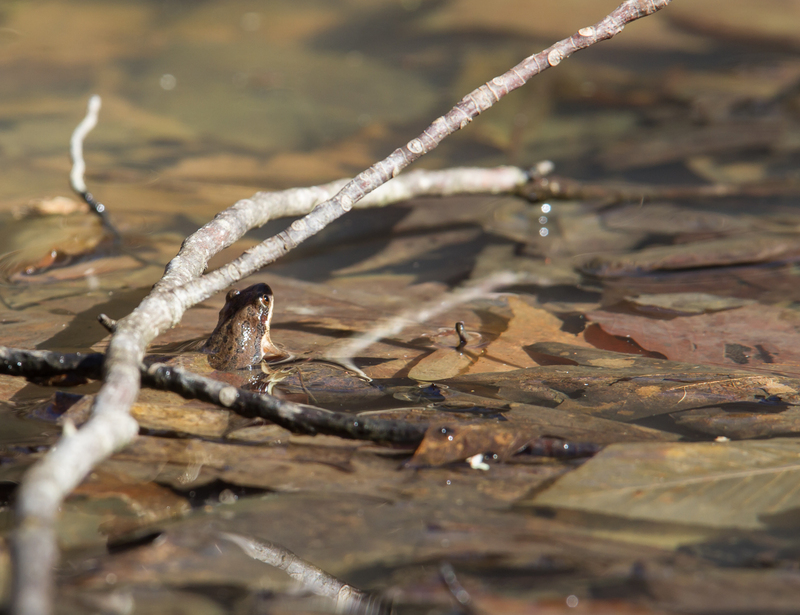 Look closely and you can see some tiny filaments off one side of the lower edge of the head region. 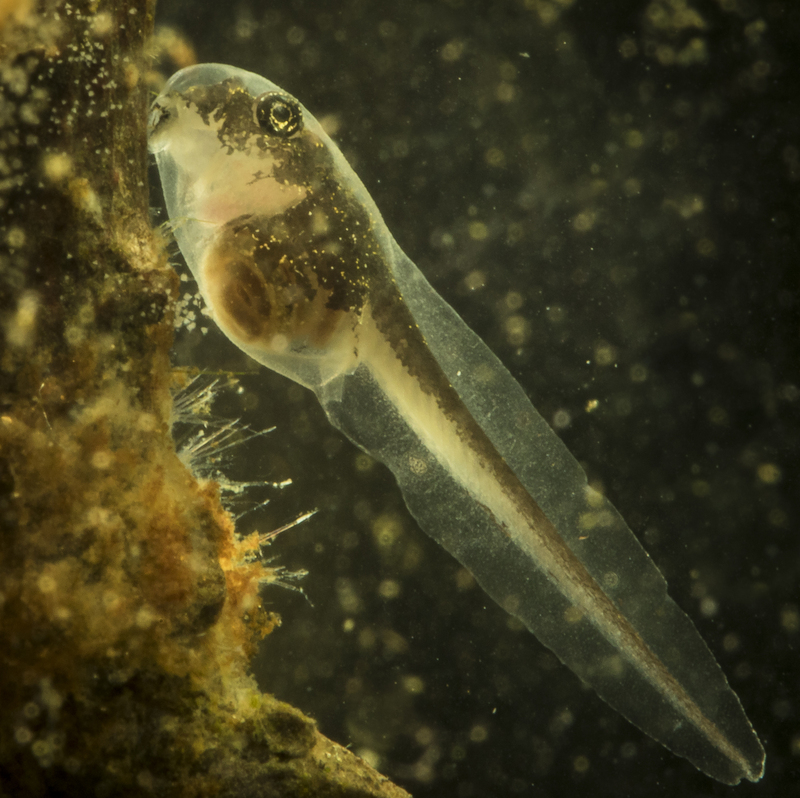 I assume these are the external gills, which only last a few days after hatching in most tadpoles. 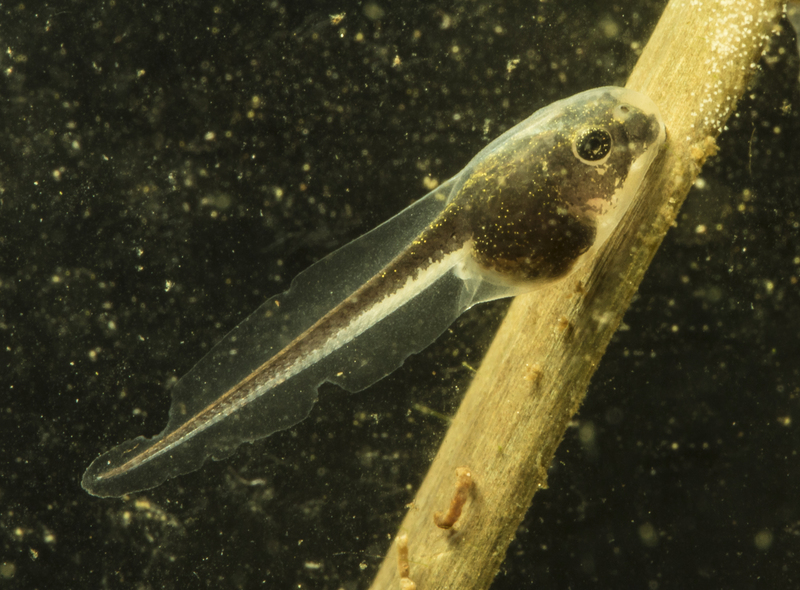 On Monday, the now two-day old critters were changing color and looked a lot more like tiny tadpoles. 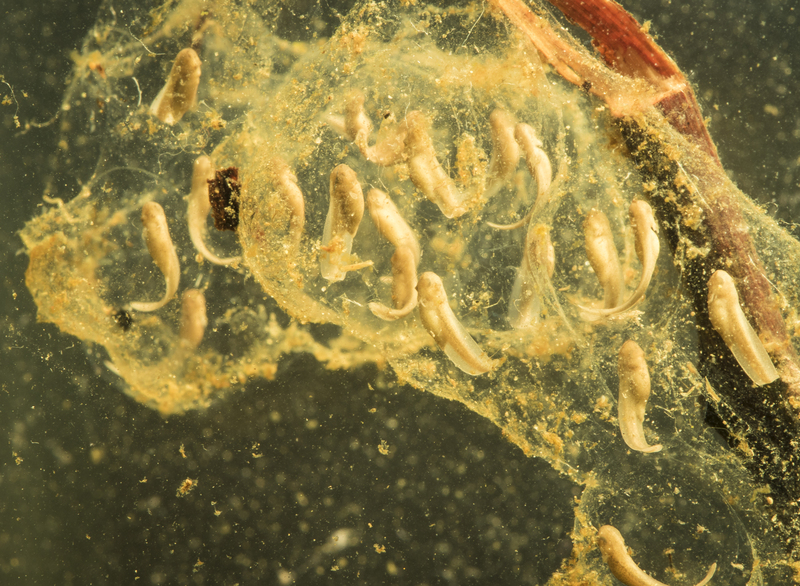 Note how the head region has enlarged, and how you can now clearly see their insides, darkening eyes, and mouth (the photo above is of their ventral side). 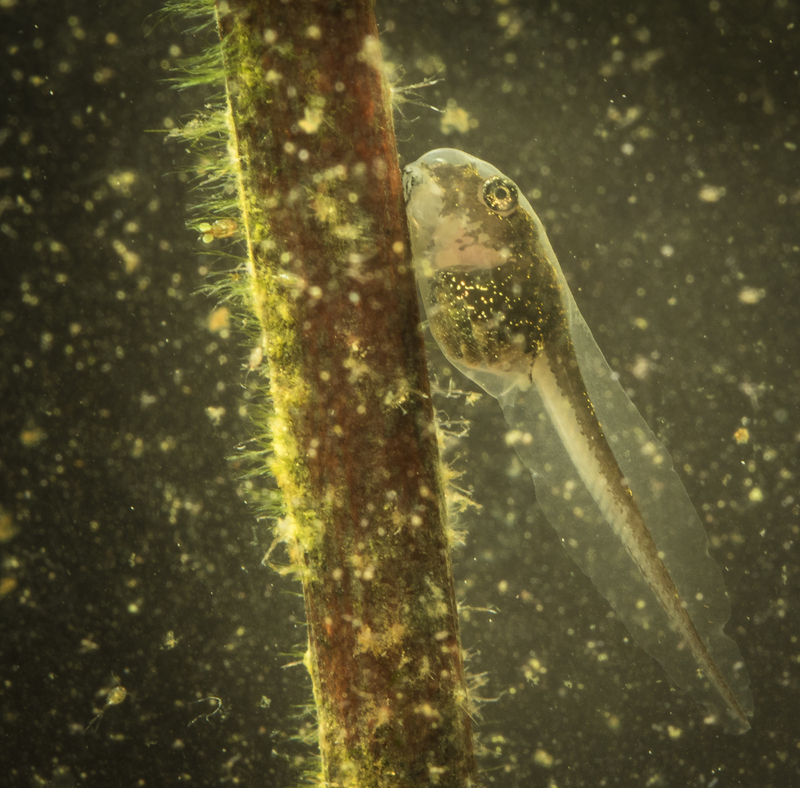 Also note the tiny zooplankton (a copepod with egg sacs) swimming just to the right of the upper tadpoles’ tail tip. 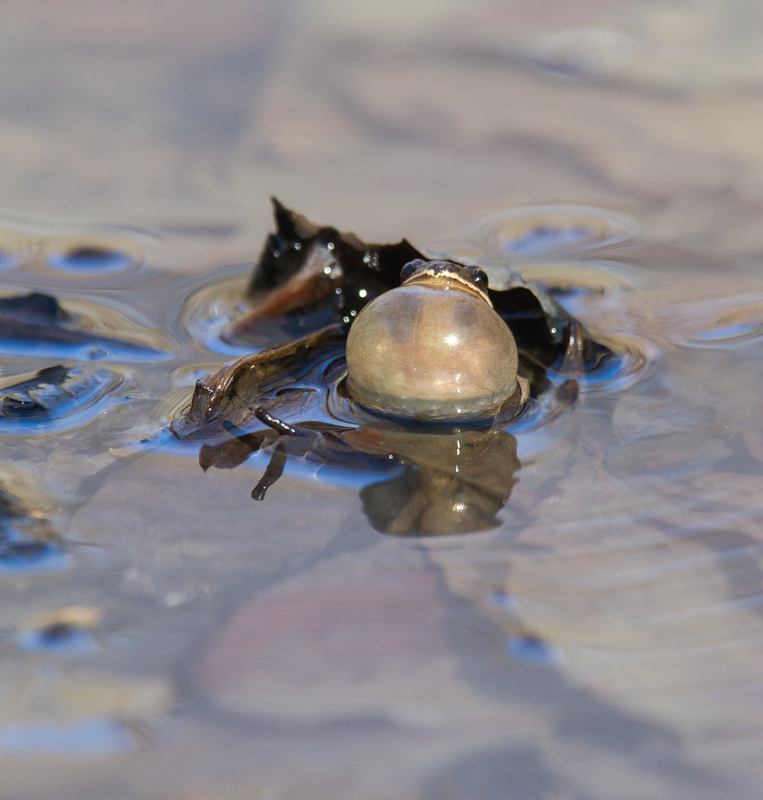 I am amazed at how much tiny life I collected when I dipped up a small bucket of water from Turtle Pond. Another couple of days go by and they are changing rapidly – darkening in color, adding subtle gold flecking, getting larger, and swimming more vigorously. 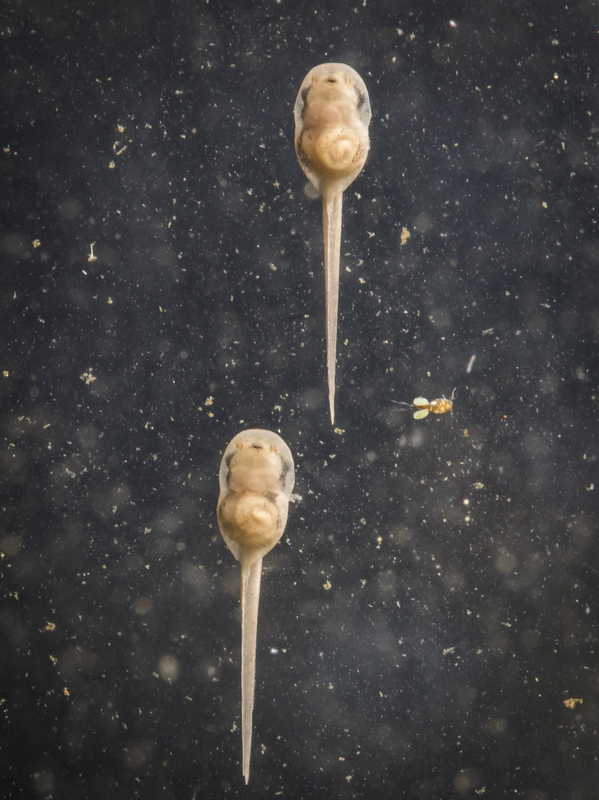 These tadpoles should transform into juvenile frogs in 6 to 8 weeks, depending on temperature and food availability. I will probably let most of them go this coming week, and hang onto just a couple in hopes of watching the rest of this amazing metamorphosis.